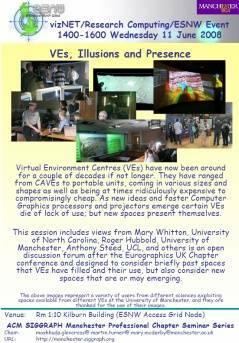 [AG-TECH] SIGGRAPH Chapter Seminar over AG: 11th June "VEs, Illusion and Presence"
" VEs, Illusions and Presence"
Virtual Environment Centres (VEs) have now been around for a couple of decades if not longer. They have ranged from CAVEs to portable units, coming in various sizes and shapes as well as being at times ridiculously expensive to compromisingly cheap. As new ideas and faster Computer Graphics processors and projectors emerge certain VEs die of lack of use; but new spaces present themselves. This session includes views from Mary Whitton, University of North Carolina, Roger Hubbold, University of Manchester, Anthony Steed, UCL, and others is an open discussion forum after the Eurographics UK Chapter conference and designed to consider briefly past spaces that VEs have filled and their use, but also consider new spaces that are or may emerging. Part of the ACM SIGGRAPH University of Manchester Professional Chapter Seminar Series: Access Grid instructions below.